“I have stolen princesses back from sleeping barrow kings. I burned down the town of Trebon. I have spent the night with Felurian and left with both my sanity and my life. I was expelled from the University at a younger age than most people are allowed in. I tread paths by moonlight that others fear to speak of during day. I have talked to Gods, loved women, and written songs that make the minstrels weep. My name is Kvothe.You may have heard of me”. For some reason, I always find it hard to write about the books I love. I know I love them, I just can’t always seem to put into words why I love them. This is one of these books. I have read it about 3 or 4 times now, and it never fails to surprise me, I always find something new in it, and I am always hooked right up until the end. 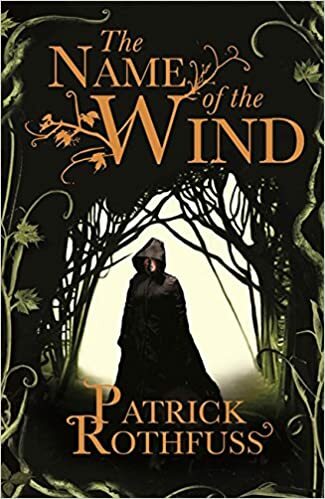 The Name of the Wind tells the story of the notorious Kvothe (pronounce “Quothe”), who has given up his adventuring days to live a quite life as an innkeeper. When a historian called the Chronicler appears, noticing straight away who he is, Kvothe accepts the offer to tell the true story of his life. He agrees, on the condition that he gets three days to tell his story,The Name of the Wind is this first day. Kvothe tells his story in chronological order, beginning with his tragic childhood in a troupe of travelling player, leaving him as an orphan. After spending years on the streets,he finally works his way to the University to study magic, where he is accepted at a young age. With no one to support him, Kvothe has to use his skills of lute playing to afford his tuition and survive. Kvothe tells his story in chronological order, beginning with his childhood in a the Edema Ruh, a troupe of travelling players. The troupe acquire the scholar ‘Abenthy’, who trains Kvothe in scienve and sympathy (causing changes in one object by manipulating another). After witnessing Abenthy calling the wind as defence, Kvothe vows to discover the name of the wind in order to control it. Shortly after, Kvothe’s father performs a song about the mythical Chandrian, which summons them and leads to them destroying the whole troupe, leaving only Kvothe alive. Orphaned and alone, Kvothe spends three years in Tarbean as a street urchin, developing his street smarts. He eventually approaches the University to continue his sympathy education. Despite passing the entrance exams, he is faced with continuous poverty and rivalry. In order to survive, Kvothe buys a lute and performs at taverns to earn money. The story is not fast paced, but it is well paced, and has immense detail. It is thought provoking, and something is always happening, rather than everything all at once. We get to know Kvothe well, I personally, love him. If you are a lover of fantasy, then this is a must read. Warning: every other book afterwards will seem dull, and insignificant in comparison. This entry was posted in 5/5, Author: Emily, Book review and tagged 5/5, book review, Books, fantasy, favourite, King Killer Chronicles, patrick rothfuss, the name of the wind by tumbling into wonderland. Bookmark the permalink.